There are over 100 floral designs from fifteen designers which you can use on your own projects. The range encompasses tiny floral motifs to large sprays and embellishments and three dimensional stump work poppies and thistles. With only a few basic stitches, you can create beautifully embroidered flowers. Techniques are clearly illustrated covering many different embroidery stitches and styles including stump work, ribbon embroidery and silk shading. All projects give needle sizes, thread types and colours in commonly used embroidery threads such as DMC, Appletons or Madeira. This handy A4 sized, soft cover book makes a wonderful gift and is a valuable resource for the hand embroiderer. 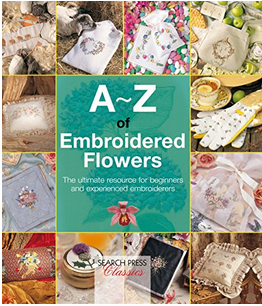 The A-Z of Embroidered Flowers in part of a series of A-Z books published by Search Press.